There are an almost limitless number of knots one can tie, but what is lesser known, is that there are ten specifically useful when sailing. 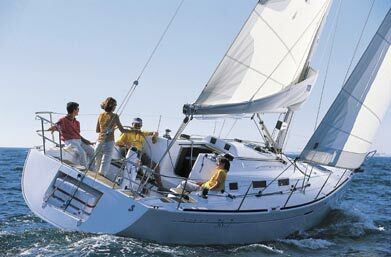 In this article we will walk you through the knots which are best to use on board. Rope will always have work to do on board a vessel. Whether it be for lashing things down, creating a dockline, or forming part of a sheet. Knots can fall into three different categories as a general rule. 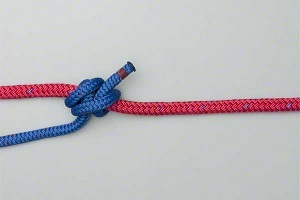 Firstly when two pieces of rope are joined by a knot, second when a rope connects to a cleat, and third when there is a knot tied at the end of the rope. The latter is known simply as a knot, whereas the first usually contains the word ‘bend’ in the knot name, and the second are known as hitches. A half hitch, followed by another half hitch. Easy. Sort of a running noose that is adaptable in size. If you need an object to be tied tight, this is your knot. Great for stopping a fender whip from slipping, and to keep a dock line secure. You pass the piece of rope around an object you need securing, then tie one hitch on top, and one to the bottom. Hailed by many sailors as the most useful knot. The bowline is formed of a fixed noose that is situated at the end of the rope, meaning that it will not slip. Therefore it is particularly useful when securing sheets to the headsail. 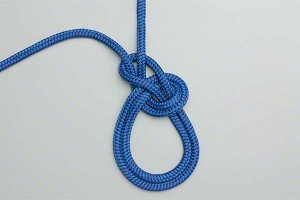 The main advantage of this type of knot is that it is always easy to untie no matter what the load. This is a multifunctional knot. It is comprised of two interconnecting lines that work together to make a longer line. These figure eight bends can also form a stopper knot in a single line format. This rope is a line that can help prevent slippage through a hole in something like a cleat. This can also be known as a Flemish knot. The Anchor Bend Knot is another type of hitching knot. 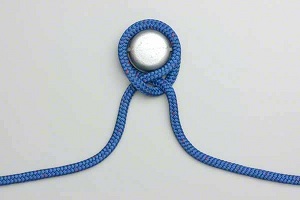 The anchor bend is thusly names as it is used to secure the line to an anchor – this is the knot’s most popular usage. A half hitch could be secured too if extra strength in the knot system is needed. 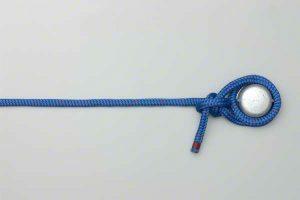 Unlike a square knot which is a popular choice for many sailors, this sheet bend knot is less likely to be loosened. It works best when there are two pieces of rope of differing diameter are tied together. You form a bight at the end, pass the end over the second line through it from underneath, and then around behind both parts of the rope and finish by passing the end of the second line underneath itself and pull tight. 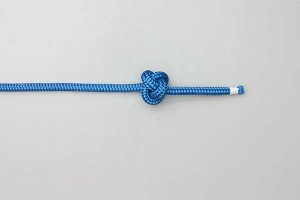 One of the most secure knots, is the double overhand stopper knot, or stopper knot for short. This is because this knot does not come undone as easily as some of the others. The trick to this one is looping the rope twice around your palm, tuck then end under the loops, and then pull the loops up over your hand and pull tight. Easy. This knot secures boats to the cleat when docked. It is easy to get wrong. As part of the family of hitch knots this one is a little trickier. Take a full turn around the base of a clear and then a figure of eight around the first cleat horn, and then the next. At the last turn pass the rope underneath itself before pulling tight. This knot is a good quick one. They are popular for securing fender whips. They are easily adjustable and so can sometimes be used to temporarily secure a dock line, however as the boat moves it may become loose so do be cautious. This is one of the most conventional knots with you wrapping the rope around an object, passing it over itself and tucking it under to pull tight. You need to use an extra line to create a rolling hitch. It can keep any rope secured to a vertical object which can be useful to help stop slippage. You wrap the rope around a fixed post or rope twice. Then take a third turn, by passing the rope over the first rope and then around the second. Also known as a Grapevine Bend, this knot is actually formed of two strangle knots. These are tied around each other to form the double fisherman knot. You can improve the strength of this structure by making a triple, or even quadruple too. It is quite simple, but it must be tied correctly. 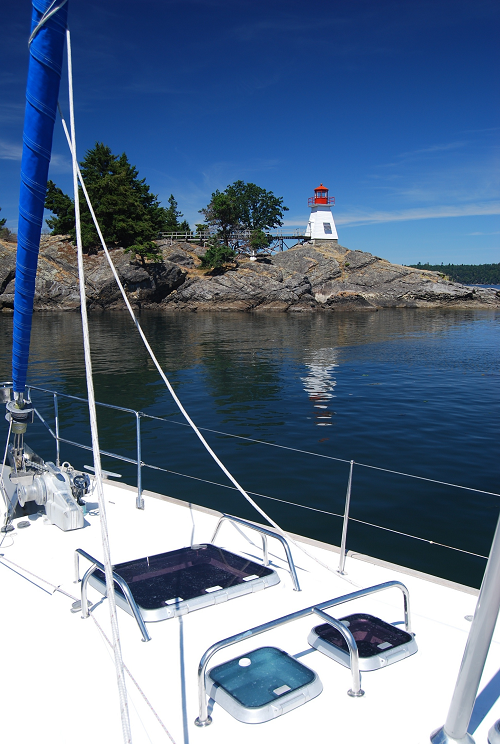 It is also often used in climbing as well as sailing. 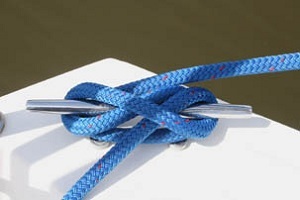 So as you can see, there are many useful knots you can tie whilst sailing, it is a good idea to practice the ones you will need before embarking on a voyage, to avoid mistakes and mishaps.